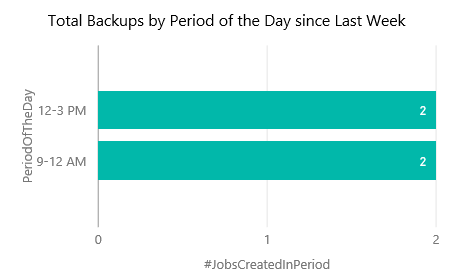 The configuration has two steps, one to configure the Azure Backup Reports connection with each service and the other is to get the data at each service. 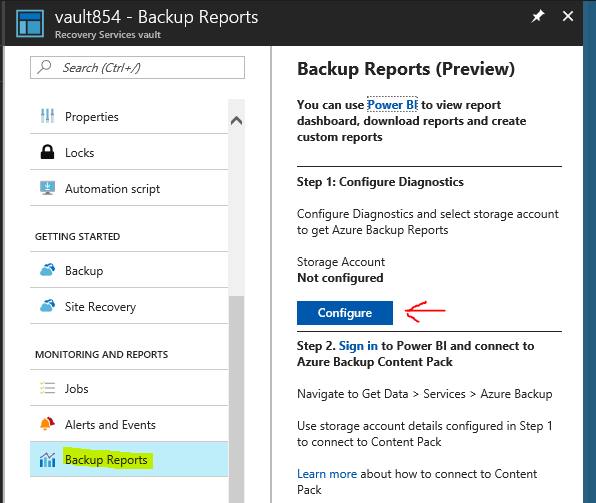 First go to a Recovery Services vault and select Backup Reports. Next press the Configure button. The Diagnostic settings blade will open. 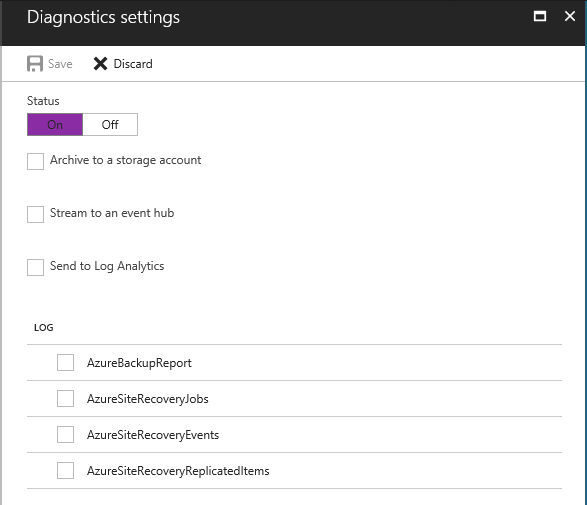 Change the Status to “On” and select the desired services to collect the Azure Backup Logs. For the Power Bi integration we need a Storage account. So check the “Archive to storage account” option and select a storage account. 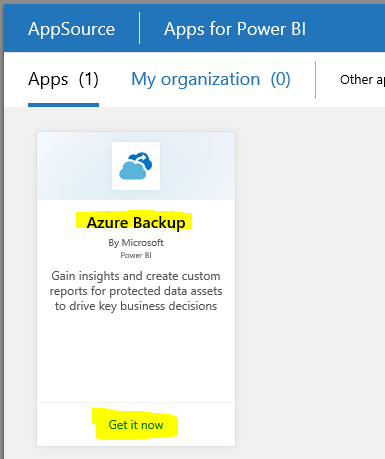 The storage account must be at the same region as the Azure Backup account. 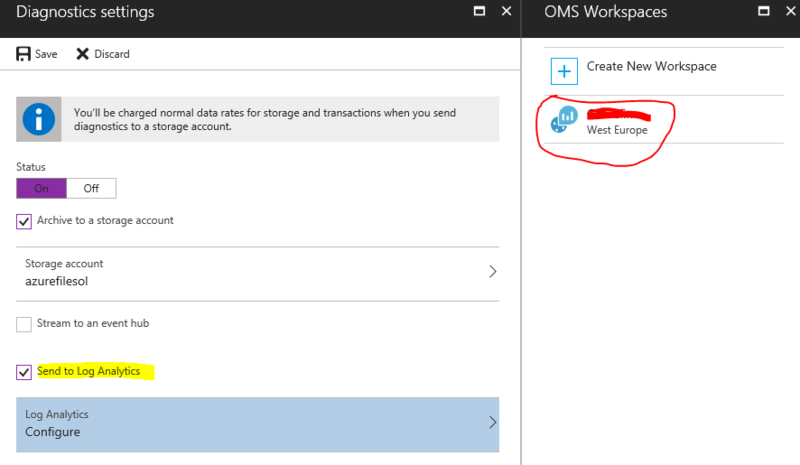 To integrate with OMS check the “Send to Log Analytics” option and select an OMS Workspace. An other option is to stream the Azure Backup logs to event hub. To configure it check the “Stream to an event hub” and select the event hub namespace and policy name. At the bottom part of the configuration blade select the Logs that you want to get. The retention days option is only for the Storage Account configuration. Press save and return to the Backup reports blade. 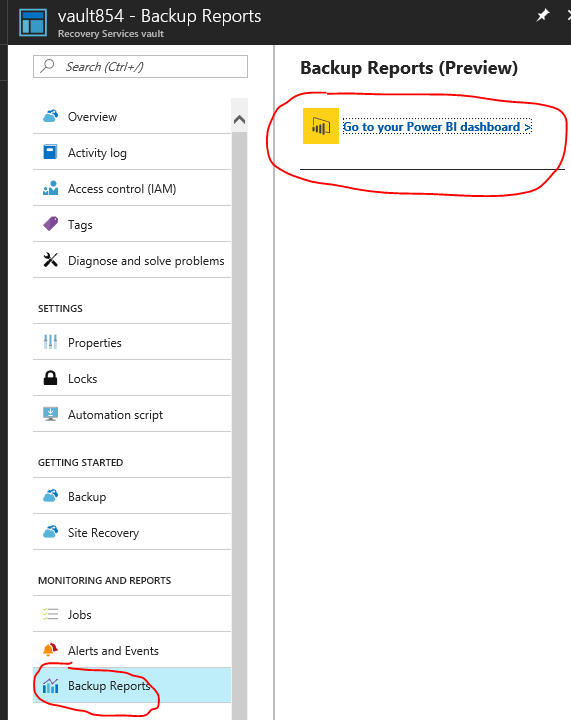 Now press the “Sign in” to connect to Power Bi to configure the Service. 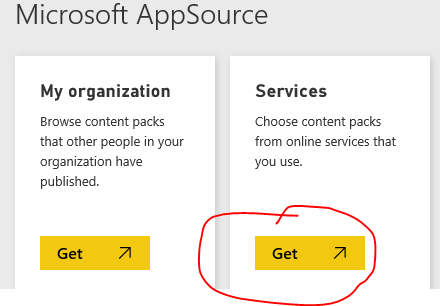 At the AppSource press the “Get” button under the Services. 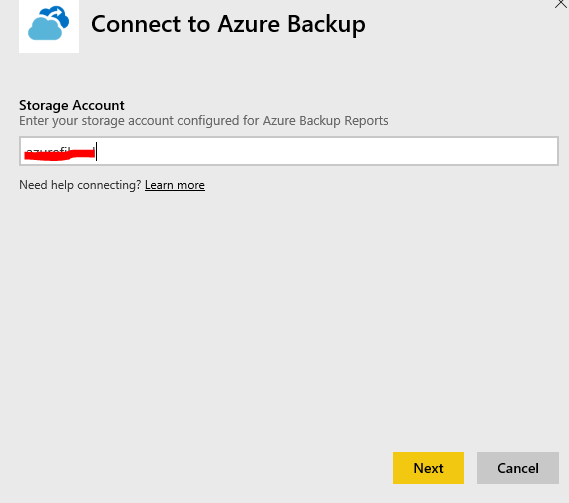 At the connect to Azure Backup page enter the Storage Account name. 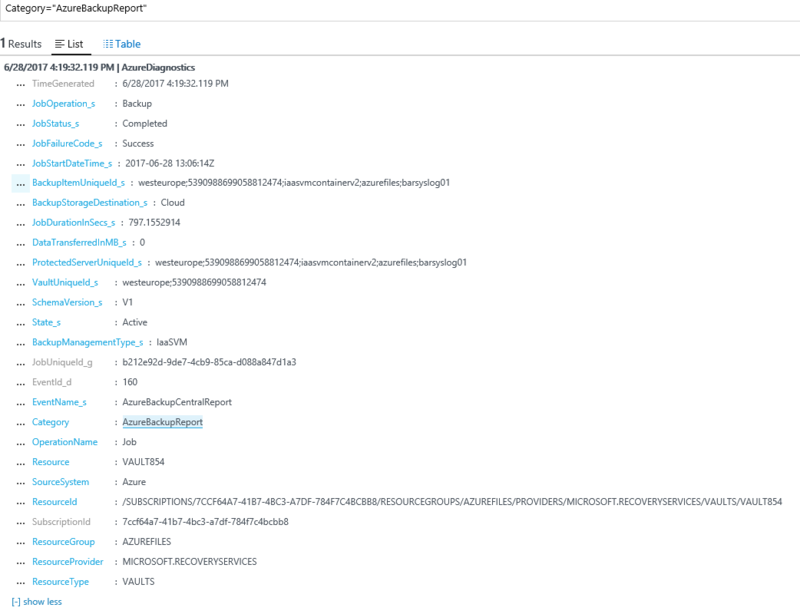 This is the storage account that we selected at the Azure Backup Reports configuration. Press next and Save. 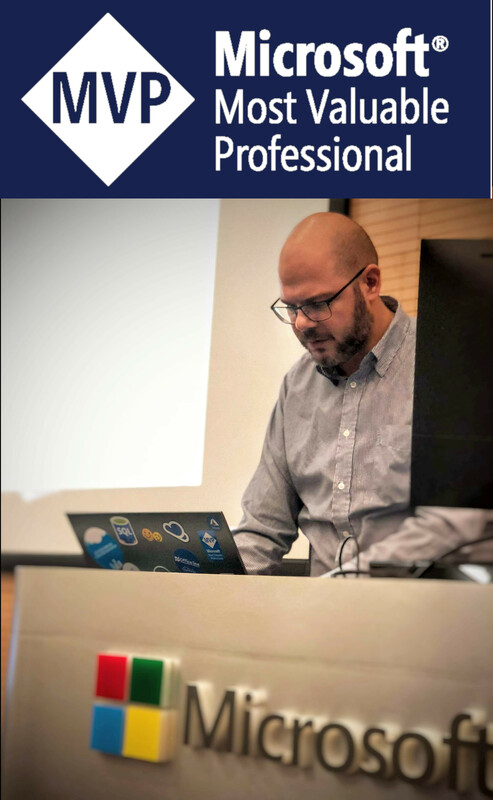 Now the Azure Backup workspace is ready. Be patient, it needs time to start reporting data. 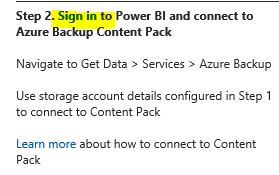 If you go back to the Azure Portal, the Backup Reports blade has changed and it only has the option to connect to your Power Bi dashboard. 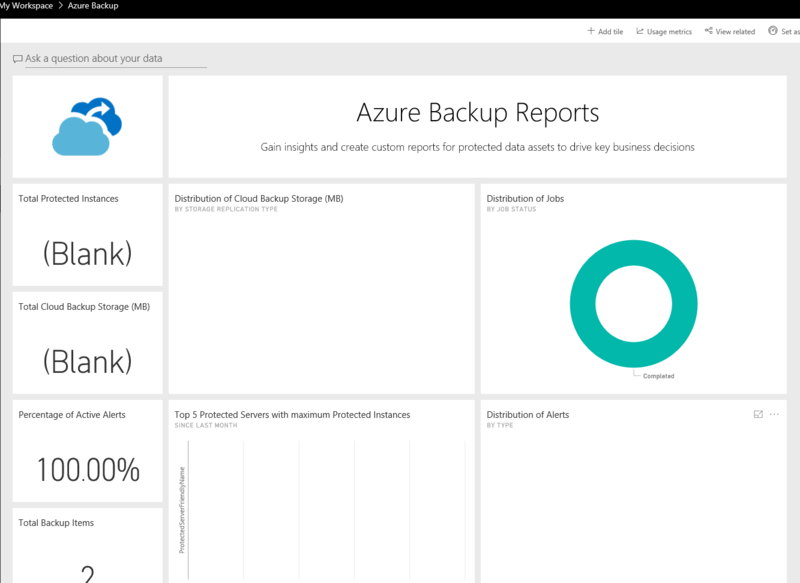 If you browse to your Power Bi dashboard, you can view the Azure Backup Reports Workspace as the below image.